A couple of years ago I made the huge mistake of dyeing my hair white (I'm talking paper white, not blonde). Ever since then I've struggled with keeping my hair healthy and strong. That was until I came across these two hair heroes. Olaplex: I've been using Olaplex No. 3 for well over a year now and I can say with absolute confidence that this is hands down the best hair discovery I've ever made. Olaplex No. 3 is a treatment that repairs broken bonds in your hair in order to create super strong and healthy hair. I use it at least once a week before I hop in the shower and then follow up with shampoo and conditioner. It's not the cheapest hair product on the market but it's definitely worth it! 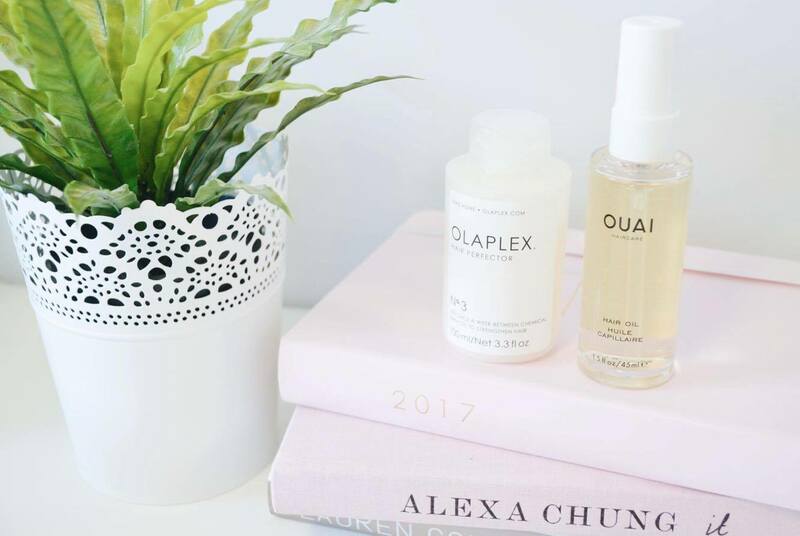 Ouai Hair Oil: I've never really been a fan of hair oils as most that I've tried tend to weigh my hair down and leave it looking greasy and heavy. However, the Ouai Hair Oil has changed my mind completely. It leaves my hair looking super shiny and sleek without weighing it down. The oil can be used either on wet hair before blowdrying or after blowdrying for extra sheen. I tend to pop a little on before and after blowdrying but that's just what works best for me! LOVE Ouai! One of my favorites as well.